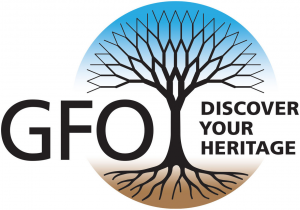 Curious about the status of your GFO Membership? 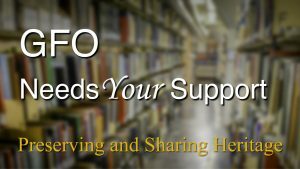 We’d love to have you as a GFO Member! For more information visit www.gfo.org, contact us at info@gfo.org, or call our library at 503-963-1932. Be sure to check the complete GFO CALENDAR. Giving Tuesday Volunteer Blitz = THANK YOU! Thank you to 34 marvelous volunteers who donated their time on Giving Tuesday! They helped to inventory and label thousands of books. 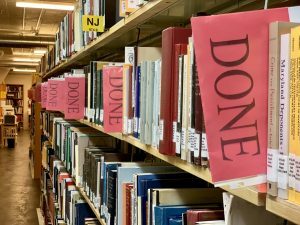 We are thrilled with the number of red “DONE” labels sticking out from so many of our shelves. No one can remember the last time we methodically took stock of what’s in our collection. 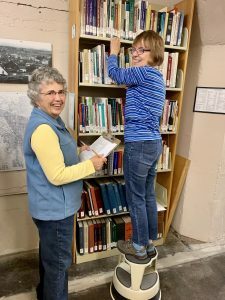 Volunteers were able to restore books to the proper order and document a number of them that are missing. It’s not exciting work but its important for a successful library. We didn’t get through all the inventory that needs to be done. Please come join us for one of our Sunday morning Work Parties so we can finish the job. As always, thank you for all you do for GFO! 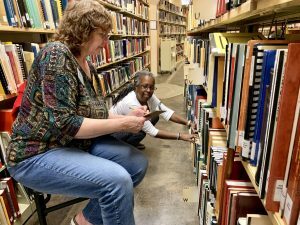 What do you call a group with no paid staff, the largest genealogy collection in the Pacific Northwest and a library that’s open daily? You know the answer: the Genealogical Forum of Oregon. But did you know that member dues cover only 24% of our budget? Our rent is going up $1200 every year. Our database subscriptions now cost almost $5,000 each year. Once each year we ask for your support. We are already 1/4 of the way to our goal! During this Annual Appeal we need to raise $25,000. That’s a big goal. We’re confident you can help us make that happen. Please make your tax deductible donation to the GFO today. The GFO belongs to the Oregon Cultural Trust. We have a Silver Star rating on GuideStar. Please check with your employer on possible matching donations, especially through Benevity. December’s meeting agenda: Duane Funk and Bonnie Randolph will share the highlights of their recent trips to ancestral towns in Germany. The German Special Interest Group (SIG) was formed in the spring of 2011. It is intended to be a source of information and inspiration for anyone with German speaking ancestors. One goal is to provide information on a variety of topics related to Germanic history and migration. We also will provide time for members to share their research journeys and connect with others who may be researching the same region or time period. The group meets at the GFO Library on the 1st Saturday of every month. Meetings start at 1:00 p.m. and end at 3:00 p.m.
All GFO’s Special Interest Groups are completely free and open to the public! Reminder: The French Canada Special Interest Group (SIG) will not meet in December this year. The group’s leader, Bob LaMarche, invites everyone to join at the SIG’s next meeting in the new year! The group is hoping to see you again on Sunday, January 20th, from 3:30 to 5 p.m.
Don’t Miss Portland’s 34th Annual ScanFair! If you have Scandinavian roots and you’ve never been to this event, well, this weekend is a great time to discover the magic! This annual event is a two-day Nordic craft fair extravaganza, complete with foods and drinks of the region. WHEN? Saturday, December 1st, 10 a.m. – 5 p.m., and Sunday, December 2nd, 10 a.m. – 4 p.m. The fair is always held on the first full weekend in December each year and is located at the Veterans Memorial Coliseum in Portland’s Rose Quarter area. See their website for a full list of vendors and other details! Land records are some of the most rewarding records for genealogical research. They generally represent the longest time span for records, and are rich in genealogical information. We’ll discuss the laws that were passed to manage land claims as new areas opened for settlement. We will explore the various original land records in Virginia, West Virginia, and Kentucky, where the land is located, and where to find the records. The discussion will include headrights, bounty land, preemption certificates and other methods of claiming land. Part Two of this series will be discussed at the group’s January 2019 meeting. For more information see our blog: “Virginia Roots and Vines”! Questions? Email Judi Scott and Carol Surrency at Virginia@gfo.org. Duane Funk and Bonnie Randolph will share the highlights of their trips to ancestral towns in Germany. Come join the fun! Explore our manuscript, personal papers, and family Bibles collection while we organize, scan, and create finding aids. Drop by at the time that works for you. Questions? Send a note to Nanci Remington and LauraDenise White at manuscripts@gfo.org. Free First Monday! 9:30 a.m. – 5 p.m.
Come visit our research library each first Monday of every month and splurge on all GFO’s wonderful resources for FREE. Explore our online databases like Fold3, Ancestry World Library Edition, Newspapers.com, and many more. Our analog and microfilm collections total some 49,000 items. Don’t miss out! Topic: Walking the Shelves: all that GFO has to offer. Lisa McCullough will be available to help answer your DNA questions, whether you are new and just getting started or have more involved questions. Curious? Send Lisa a message at dna_qa@gfo.org, or feel free to just drop by!